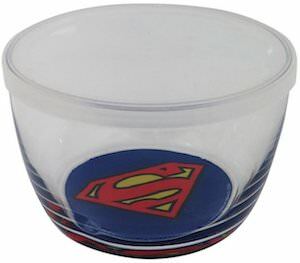 We all need bowls for leftovers and luckily you can now get this Superman storage container. The glass storage container has a plastic lid and in the bottom of the bowl you can find the famous logo used by Superman and Supergirl. The Supergirl storage container is perfect in size and it is dishwasher safe so that it is ready quickly for tomorrow when there maybe new leftovers. So if you want to rid of plastic storage boxes then this glass one is the way to go as it is just cool and made from glass and looks amazing especially if you like Superman. Of course you want your kids to eat healthy when away and how do you make that fun for them? Easy get them a FUNtainer like this one with iCarly on it. The FUNtainer is made by Thermos and all the plastic parts are BPA free and the inside is stainless steel. The best thing is that it will keep the food stored in it cold for up to 7 hours and hot for up to 5. So now you kid can eat the good foods you give it at the temperature that is ready to eat. iCarly is has her picture on this FUNtainer and the pink plastic parts will make it the ideal girls lunch container. Have a better look at this iCarly FUNtainer. Dora the explorer and her best friend Boots are now pictured on this food storage jar from Thermos. The FUNtainer will keep the food in the jar warm or cold for hours. A great way to give your kid’s there favorite food to school and daycare without having to worry about it. 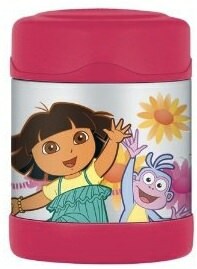 Check out this Dora The Explorer FUNtainer Food Storage Jar. If you work in an electronic store you need a nice warm lunch and how do you keep your food warm? Simple just get a Buy More Food Thermos to keep your food fresh and warm. I am pretty sure that Chuck and his CIA friends will all have one because those missions can take a long time. 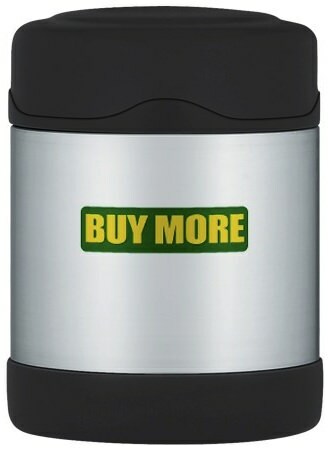 Check out this Buy More Food Thermos. 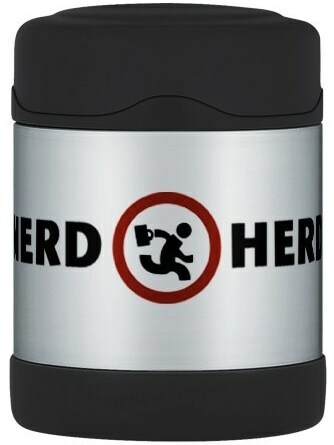 Chuck works as a Nerd Herder at the Buy More and of course he brings his own lunch in this cool Nerd Herd food Thermos. Now the lunch from Chuck stays nice and warm or cold at the hot days. Be part of the Nerd Herd by getting this Nerd herd Food Thermos. Of course you bring your lunch from home because it taste so much better then cafeteria food. 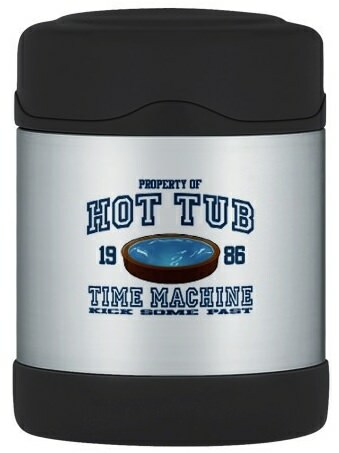 And now a boring food container became so much better with this Hot Tub Time Machine container from Thermos. It keeps hot food warm and cold food cold so what else do you want besides traveling in time in a hot tub. Go check out this Hot Tub Time Machine Funtainer.